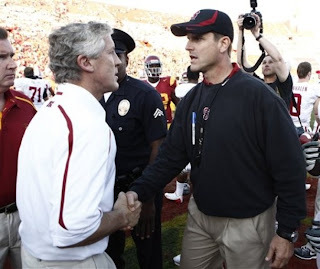 Pete Carroll and Jim Harbaugh do not have the best of relations, dating back to when Harbaugh's Cardinal blew out Carroll's Trojans at the Coliseum with the then-USC coach alleging that the then-Stanford coach ran up the score. Well they have another West Coast showdown this Thursday night as the Seahawks and the 49ers are tied (along with the Cardinals) atop the NFC West. Who will be victorious in that game and all others this week in the NFL? It is time for the B-FLO 360 week seven selections. I love to watch both of these defense play, and both are in the top four statistically, and so I think we will get an old-fashioned, low-scoring ballgame on Thursday evening at the Stick. I am looking for both of these clubs to try and control possession and rely on the running game so I think the difference will be in who can make enough plays in the passing game. Russell Wilson has made a lot of strides this season and was great last week against New England but he has yet to face a defense as good as the 49ers. Nothing to get the juices flowing quite like a matchup of AFC bottom-feeders. Cleveland was able to get their first win of the season in a pretty impressive showing against the Bengals on Sunday afternoon and a big reason why I like them in this game is that Joe Haden has had a week back after his suspension concluded and will be ready to go and shut down Reggie Wayne, who really is Andrew Luck's only receiving threat save for their two talented tight ends. The only qualm I have is if Trent Richardson is not fully healthy this Sunday. I am not particularly sold on the Titans after their upset win against the Steelers but what I was very impressed with was how well they stuffed Pittsburgh in the running game, only allowing 56 rushing yards and forcing Pittsburgh to abandon the run early. The only thing the Bills do well is run the football with C.J. Spiller and Fred Jackson both looking good in last Sunday's overtime upset of Arizona but against Tennessee, they will be forced to rely on Ryan Fitzpatrick, something they should not have much confidence in doing. This will be the first game after the team suffered a couple of huge losses with Ray Lewis and Ladarius Webb suffering injuries that will keep them out for the rest of 2012. Those are such key pieces of their defense and especially with Lewis, the heart and soul of the club. That, coupled with a Houston team that got embarrassed on Sunday night by Green Bay and looking to bounce-back, gives the edge to the Texans. Should be a great game nonetheless. The Cardinals once again have the musical chairs going on at quarterback after it was Kevin Kolb who got injured late in the overtime loss to Buffalo last Sunday and John Skelton will get the start. Whoever will get the start will not on upright very awful as the Cardinals' awful tackles will struggle to keep Jared Allen and a good Vikings defensive line at bay. Both of these teams have really struggled this season to defend the pass, as the Saints are 26th in the league and the Buccaneers are 31st league-wide, and they moved up last week because they were fortunate to take on Brady Quinn. Now while Tampa will attempt to work on their run game to keep the ball out of Drew Brees' hands, I think the Saints have some positive momentum after getting off the schneid two weeks ago and will ride Brees to another victory. The Cowboys are coming off a classic Cowboys loss, one in which they butchered the end of game strategy so badly that it resulted in the defeat at the hands of the Baltimore Ravens. But fortunately for them, they face a Panthers club that has looked absolutely awful and Cam Newton will continue to struggle against what has been a pretty good Dallas pass defense. I feel this could end disastrously, but the Cowboys are my Lock of the Week. We had been waiting for the Packers to put together a performance like they did Sunday night in Houston after performing pretty inconsistently through the first quarter of the season. Aaron Rodgers was brilliant and the defense was very strong against a club that many thought was one of the elite teams in football. I don't think we will see a repeat of a performance like that this week against the Rams who are very physical on defense and are strong against the pass, the Rams' scoring deficiencies will hurt them here. Neither of these clubs are really any good against the pass, although the Giants did a hell of a job against Alex Smith last week with Antrel Rolle actually making plays. What I think was really impressive was the job the Giants did running the ball in the second half in San Francisco and controlling the clock. What will really kill Robert Griffin III and Washington is their atrocious pass defense, the worst in the league statistically, which will get carved up by Eli Manning. Save for that fluky touchdown pass late in the Colts game, the Jaguars have been hilariously awful on offense all season long and they are the worst statistically in the league in yardage, scoring and passing. Blaine Gabbert has been incompetent once again and the team is overly reliant on Maurice Jones-Drew. Oakland did come close to upsetting the Falcons and I think they will do enough to get by the Jags. Very strange that the AFC East is all knotted up with all four clubs tied at 3-3 but it is what it is. New York is coming off a big blowout victory at home against the Colts and their success in the running game was the main reason as Shonn Greene put together a tremendous performance but with their two backup running backs either out (Bilal Powell) or likely out (Joe McKnight), Greene will have to carry a large workload against a pretty solid New England run defense that will force Mark Sanchez to beat them. And while the Jets have been very good stopping the pass, to beat Tom Brady you have to pressure him and the Jets are one of the worst teams in sacking the quarterback in the league. Cincinnati was pretty disappointing against the Browns in giving that downtrodden club their first win of the season and they come into this one with two straight losses. Andy Dalton has not helped the cause by turning the ball over like he has with five interceptions in the past two games and that will not cut it against the Steelers, who have something to prove as they sit at 2-3. The one thing that Pittsburgh needs to do is to get the running game cranked up and fortunately, the Bengals are not that great against the run. I do believe that the Lions found their groove on Sunday afternoon in Philadelphia and I think they can get themselves on the right track for the rest of the season, but they do face a Bears club that is rolling this season, especially on defense. The Bears are not that great in defending the pass, right around the middle of the league, but one thing they excel at is getting to the passer and they should find successful against a team that is so passing dominant like Detroit.